An indoor show at Newark County Showground, NG24 2NY, just off the A1/A46 junction, in the Lady Eastwood Hall. Open 9 til 3, free parking, indoor café. With up to 100 trade stalls selling Militaria.- From Military Vehicles, Books, Manuals, Vehicle parts, Uniforms, 40's Fashion, Radios, Medals, Models, Guns, Accessories and much more! Admission £5 per person. Also, sell your vehicle there too! We have a special parking area for you to display and sell your vehicle (for just £20 for the day). For more information (traders and public) either call or email. Park and Ride at Discovery Park all three days. Follow the signs on Sandwich by pass to Discovery Park Visitor Centre for car park and free bus ride to Sandwich. A P22 Gunship manned by a crew of 6 and armoured with three 50 calibre Browning machine guns will moor on the River in Sandwich for the weekend. It will be the heart of a weekend of re-enacting the 40s with over 200 experienced re-enactors taking part. The likes of the Desert Rats, RAF, Red Cross Nurses, Military Police, Home Guard, Land Army Girls, number 4 Commando Group and more will bring to life scenes including rescuing downed airmen from the Sea and stretchering the wounded to field hospitals . Air raid sirens and the sound of gunfire will add to the feel of authentic WW2 atmosphere. Further information can be found on the website. Temple at War has rapidly gained an outstanding reputation for the high quality re-enactment on display. In only the events fourth year it is now known throughout Europe as one of the best Military events to attend. Events take place throughout the village, including vintage vehicle displays, evacuees event, re-enactments, speeches from Churchill, Jive dancing, singing and bands playing. Market stalls offering a wide range of goods, food and souvenirs. Full details on the events, evening dances (Friday and Saturday) and additional parking in the village can be found on the event website and facebook page. Experience many of the sights and sounds of a World War Two village. Harking back to 1944, the museum is alive with civilian and military personnel. There will be music and dance tuition, military demonstrations, re-enactments and much more. Visit this weekend for an immersive experience and find out what Great Britain was like nearing the end of the War. Join us as this highly popular event returns to Stow Maries Great War Aerodrome. A fun day for the family that marries our favourite aircraft with cars! Everything from classic and vintage four-wheelers, motorbikes and coaches to vintage aircraft. A celebration of vehicles from both land and air. With a great range of exhibitors, a BBQ and not to mention our three exhibitions, The Mess and Shop. The Royal British Legion for 2019 have teamed up with Fred Olsen Cruise lines to provide an anniversary D-Day Cruise. This will take the Vets, their families and friends from Dover to Dunkirk, Poole, Portsmouth, Le Havre, Cherbourg and back to Dover. As a club we have been invited to provide WW2 Vehicles to provide a display and create an atmosphere as the Vets embark on their Cruise from Dover. This will take place on Sunday afternoon the 2nd of June 2019. 75th Anniversary of Operation Overlord. Planning is well underway for the IMPS 2019 tour of Normandy. Our campsite is already booked and several guided tours around the region have already been organised with experienced experts. We are linking up with local groups and the MVT to participate in the commemorations, including parades in Port en Bessin and Bayeux. We will be travelling to/from France via Portsmouth/Caen. The outward crossings will be either the overnight ferry leaving Sunday 2nd June or the daytime crossing on Monday 3rd June. The return crossings will be on Monday 10th June 2019. The duration of the trip will be 7 nights. We will be “occupying” a campsite which is located mid-way along the landing beaches. This makes it easy to visit all the sites relevant to Operation Overlord and the breakout. It provides a very high standard of facilities, with both camping and on site cabins available, it has an on-site swimming pool, excellent showers, a bar/cafe area and great access for the larger vehicles. We now need YOU to make a commitment to the tour by filling in the form. As in previous years we will ask for stage payments between now and the tour, this should help to spread your outgoings in proportion to the clubs outgoings, so it helps everybody! Please give as much information as you can at this stage, but we understand that there may be some changes necessary over the intervening time, you will be asked for more detailed information nearer the time. Please include your email address so we can save on postage and get the very latest information to you as it happens. If you change your email address please make sure you update us. We will not intentionally divulge this information to any third party. But we may send you links to museums etc. The tour is being arranged by IMPS so the entrant needs to be a current IMPS member, and still be a member at the time of the tour. Space is limited so entries will be strictly on a first come first served basis. If all the spaces are filled, you will be placed, in order, on a reserve list. Entry forms available by emailing Gareth Wear. For all car, motorcycle and military enthusiasts. Open air autojumble with on-site licensed bar. Regular traders and enthusiasts having a clear-out welcome. Free Parking. The Portcullis Club, Kenley Airfield, Victor Beamish Avenue, Caterham, Surrey. CR3 5FX - just off Jct 6, M25, for sat nav use CR3 5LT. Pitches: Trade Vans £20. Private Cars £15. Traders access from Saturday afternoon with free overnight camping. Public entry: £2.50 9am to 4pm. The 6 June 2019 will mark the 75th anniversary of the D-Day Landings in Normandy and we at Portsmouth City Council are proud that Portsmouth will be at the heart of the UK's commemorations. We will be honouring the courageous actions of the Normandy veterans, World War II veterans and our allies with a series of events between Wednesday 5 June and Sunday 9 June 2019. As part of those commemorations I would like to ask on behalf of Portsmouth City Council if the Invicta Military Vehicle Preservation Society and its members would be interested in getting involved by displaying some of its members' period vehicles on Southsea Common over Friday 7 June through to Sunday 9 June for public view. We are keen for them to form a centrepiece on Southsea Common and accompany, among other things, a vintage fair, food stalls and live performance stage. We would greatly value the fact that a display of military vehicles, accompanied by some of their owners (no doubt with some interesting stories of their own to tell about them), will add colour and interest to the commemorations for all those attending. At this stage, we would be grateful for expressions of interest from members. Amy Tilt (Events and Sponsorship Manager) or Daniel Watts, (Events Team) can be contacted on the emails below. We look forward to hearing from you. Mustard’s Farm, Isle of Sheppey. Superb weekend of events and enjoyment. Camping available all weekend, BBQ etc. If you are interested in attending contact Chris Beal on 07899 788350 or by email. Background Information - On the 5th June 1944, General Eisenhower drove from his Headquarters at Southwick to Greenham Common Airfield, Newbury, to speak to US airborne troops prior to Operation Overlord. On the 22 June 2019 during the 75th Anniversary Year of D-Day there are plans to drive the route taken by Eisenhower to commemorate this historic occasion. Vehicle owners are invited to take part in support of this fundraising initiative for the Royal British Legion Riders Branch. To apply for an entry form contact - Michael Burne by email or phone 01483 504070 or 07765 266324. Colin Davis is looking for members that would be interested in displaying their pride and joys to the public attending on the Open Day. There will be no charge to anyone exhibiting their vehicles and they will be welcome to join any guided tours carried out throughout the open days. Bringing the story of tanks, tank crew and soldiers to life...Join us for the world's biggest and best live display of historic armour, living history, and much more at the Home of the Tank - The Tank Museum, Bovington. Military vehicles may be able to attend this event. To pre-book email Georgina Martin. The North of Englands biggest military vehicle and Re-enactment show. With over 500 military vehicles including Armour, 60 plus re-enactment groups and over 80 military/vintage trade stalls. WW1 & WW2 battle re-enactments on both days, softskin & armoured vehicle parades, day & night time entertainment. For more information, please visit our website, join our facebook group or email us. Featuring an array of military vehicles, from the Second World War until the modern day. Enjoy vehicle displays, battle re-enactments, music, plus many trade stands and stalls. More information on the website. The legendary Dallas Dig Outs are held at our premises and are an increasingly popular fixture in the military vehicle calendar. Sell those unwanted military vehicle parts or militaria from your boot for just £8, or come as a visitor – entry is just a £1. We have onsite catering. As well as a busy autojumbling event, enthusiasts enjoy the social aspect and of course Dallas Auto Parts is open for business with some special Dig Out Bargains! Held at various locations around the village. Military/classic vehicles, re-enactors and living history, vintage bus rides, outdoor concerts, dances, traders market plus much more. The entry fee of £12 covers vehicle, driver and one crew for the duration of the festival. To enter please apply directly to Lyndon York using the form on the website, link below. If accepted, your entry will include your 3 day pass for the weekend. Larger exhibits may, at the discretion of the organisers, receive an extra 3 day pass for crew. All other passengers will require their own passes. These can be purchased with this form (see below), from the Tickets page on this website, or on the gate. Please note that due to revised Health and Safety requirements no vehicle movements, other than service vehicles, are permitted on the main Festival site during published Festival opening times. Please therefore arrive in time to be parked in your allocated area. Amphibious vehicles are an exception to this rule but must please remain within their allocated area and not go roaming the site, other than on the water! 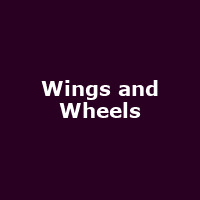 Wings & Wheels Family Festival 2019 with a dedicated Military Area. Cars, Bikes, Military Vehicles and family fun. Evening concert Saturday 20th July - Fun Day Sunday 21st July 2019. Entry forms and information available from the website. Contact Ciaran 01708 457040 or by email. The largest celebration of military history and vintage lifestyle in the world. This national-level living-history event focussing on the British Armed Forces of the Great War returns in all its glory for its third year. From Soldiers to Nurses and Airmen, their uniforms, weaponry, equipment and training, as well as the everyday tasks of the Great War soldier. There will be authentic demonstrations showing various skills which a soldier would have had to acquire to enable him to do his job “in the field”. Stow Maries historic site also offers an impressive collection of Great War aircraft as well as Museums, Mess and shop. A great educational day for all the family. MILITARY VEHICLE SHOW & VINTAGE AIRCRAFT WEEKEND. Headcorn Aerodrome, near Maidstone, Kent. In association with IMPS. This Event will be open to the public on the Saturday and Sunday. Featuring: A ‘fly-in’ of Vintage Military and Civilian aircraft, including famous WW2 warplanes, continuously throughout the whole week-end. Military vehicle displays, Live Arena Battle-action, Tank and Armoured vehicle demonstrations. Living History and Re-enactment Groups, Militaria and Trade stalls, Bars/refreshments. A real action packed week-end, on the ground and in the air. Volunteers are wanted to assist with the running of the show at all levels, to volunteer contact Chris Yates at Headcorn Special Events by email. Contact details and entry forms via the website. The military heritage preservation charity, Essex HMVA, would like to announce that their flagship event, the Military and Flying Machines show is to be renamed Echoes of History, which will be a multi-period history-based event, that will take place at Barons Lane, Purleigh, Essex, CM9 6PF. The Essex HMVA is committed to its aims to promote an understanding of military preservation as well as military history, providing a source of education and information to support similar minded individuals and organisations. Associate memberships are available (and ownership of a military vehicle is not a requirement) as many of our members have collections of varying military objects. Now under new ownership, this enormous event includes multi period living history and re-enactments, collectors’ market and indoor fair it’s a fun long weekend’s entertainment for all the family. Public camping available (must be booked in advance). Full booking details online or contact James Aslett 07595 511981 / +44 (0)1268 772 448. The ultimate family day out! You will never see such a spectacular display of dozens of tanks firing, crushing cars and speed demonstrations, all in the UK’s biggest tank arena! See website for more information. The show ground is situated just 1 mile from Dunchurch Village Center on the A426 in Warwickshire and 5 miles from Rugby. Easy access off the A45 and M45. Sat nav postcode: CV22 6NR.